Located in the historic Gearhart Hotel, The Sand Trap Pub is classically McMenamin's. Art Deco decor dominates the design of this newest hotel in the McMenamin's chain which opened in March of 2012. Oven Baked Crab Mac & Cheese with a side of Cajun Tots....comfort food on a blustery winter day at the beach. My Crab Mac & Cheese had great flavor. The crab was cut Into very small pieces, and would have been better to have been in bigger noticeable chunks. The cheese sauce was very loose, making it hard to eat with a fork. It would have been far better if it had been allowed to tighten up more. The blend of cheeses was great and the locally sourced pasta was perfectly cooked. Overall very good, but easily could have been great with a few minor changes, in my opinion. I also had a half order of the house cajun tots. A McMenamin's staple, this is one of the core appetizers you can count on finding at every McMenamin's Brew Pub and restaurant. They are consistent, and they are addictive. I try, but have never been able to eat at a McMenamin's property without ordering a plate of these spicy wonders with extra ranch. Another staple of every McMenamin's pub is their 1/3 pound burger selection. My wife went with the Dungeon burger today, a 1/3 burger topped with swiss cheese and grilled mushrooms. It was ordered and received a perfect medium, and getting through the full burger was a close thing for her. As always the burger was exactly as expected and perfectly done. Not the most inspired meal in the world, but it always amazes me how many places can mess up a basic hamburger. The Sand Trap will not let you down here. In all the Sand Trap was just what we were looking for today. Great comfort food on a blustery Oregon Coast day. 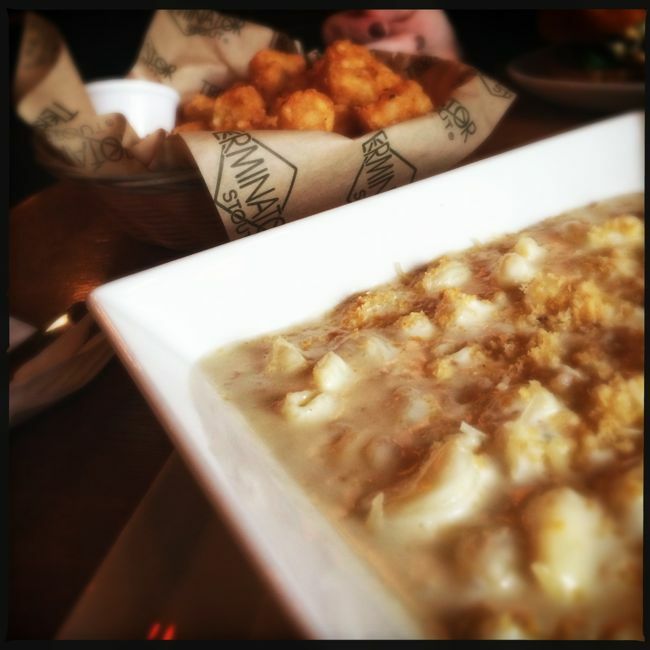 The Mac & Cheese was a pleasant surprise, and the rest of the experience was up to the high standards we expect from a stop at McMenamin's pubs.